Jeff Bergquist is pleased and proud to have been invited to perform several roles in Keith Bilderbeck's original musicals, including Kosschay in Kosschay the Deathless, the Grey Wolf in The Firebird, the Alligator (and Zombies) in The Fountain of Youth, and Odysseus in The Odyssey.. In his youth, Jeff was lucky enough to have landed leading acting roles in LORT repertory theaters across the country, including Denver Center Theatre, the Guthrie Theatre, and Mark Taper Forum. Locally, after a romp as Sir Toby Belch in Shakespeare's Twelfth Night at the Will Geer Theatricum Botanicum, Jeff returned to play Kurt Müller in Lillian Hellman's Watch on the Rhine, then Mr. Snobson in Fashion, or Life in New York by Anna Cora Mowatt; Crabtree in The School for Scandal by Richard Brinsley Sheridan, and Orgon in Molière's Tartuffe. He has also devoted himself to such independent films as Daybreak, written and directed by Mike Kacey; Paul Bojack's Glass Necktie; Jon Stevens' award-winning Irish Whiskey; Ben Vaughn and Dan Marcus's Rambler '65; writer/director John Norvet's feature film debut, The Missing Link; and Dan MacCannell's Henry X.
Jeff also co-wrote and acted in Phyllis Elliott's half-hour TV pilot, Aria 51 (yes, it's a pun). Jeff (bass/baritone) and Phyllis (soprano) have appeared together in a number of operas produced in the Los Angeles area. 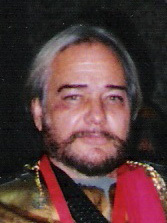 He portrayed the King of ancient Egypt in Verdi's Aida, the ghost of Charles V, Holy Roman Emperor, in Don Carlo, Dr. Grenvil in multiple productions of La Traviata, Silvano in Un Ballo in Maschera, Marullo in Rigoletto, Simone in Gianni Schicchi, and the Imperial Commissioner in Madama Butterfly. He is the creator and executive producer of New Playwrights Foundation's feature-length documentary movie, "Volunteers for Verdi", about the production of Don Carlo. Formerly playwright-in-residence for Cebu Performing Arts Foundation, Jeff completed a musical version of the O. Henry short story, "Gift of the Magi" (with lyrics and music written by Dan Marcus) which is performed every Christmas at Crispin Ramos' Garden Theater in Cebu, the Philippines. In 2006 Jeff retired from his "day job" grinding out feature film scripts as a salaried co-writer, and has been able to work exclusively on his own projects. Published and produced playwright, prize-winning poet, lyricist, librettist, and short story author; novelist; multi-optioned screenwriter; producer of theater, video, micro-budget features and short films, Jeff has served as Artistic Director of New Playwrights Foundation since 1985. He may be reached by e-mail at dialogue@newplaywrights.org.